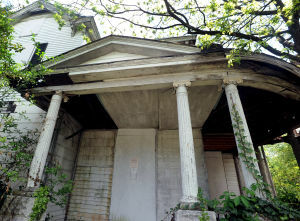 840 North Main street is one of many structures on the blight list. Danville has a blight problem. That statement will not make headlines. We have known this for decades, and in the past several years, the city has taken many steps in addressing this problem, primarily centered around demolitions. Of the 2,000 plus blighted structures in our city, we are only able to demolish roughly 100 a year. Clearly, we cannot demolish our way out of this problem. Fortunately, our city leaders recognize this as well and have adopted other measures in addition to demolitions, including a low-interest loan pool for repairs, a receivership program and the establishment of the Old West End Rental Inspection District. With that being said, there are still other methods that we can, and must, explore. Recently, I proposed to my fellow council members that Danville adopt an online auction system for the blighted properties that the city is in possession of. Granted, many of the properties the city has are beyond any hopes of repair and demolition is the only viable solution. However, there are some properties that can, and should, be restored and returned to occupation. For these homes, an online auction system would be a prudent and financially responsible solution. Several cities across the nation have recently put in place some form of an auction system as a way to deal with their blighted properties, with Detroit being the most high-profile example. Very rarely do I ever look to Detroit for ideas but in this case, they have found a good one. Their program, known as “Building Detroit” is simple: a website is setup that features all of the blighted properties that the city has made available for purchase. If a person sees a property he likes, he can bid on it. » They are also limited to the purchase of one property per month through the bidding process. » Within 30 days after closing, the buyer must provide the Land Bank an executed copy of a contract to rehab the home. » If they can demonstrate to the Land Bank they have the skills to rehab the house themselves, within 30 days after closing they must provide the Land Bank receipts showing they have purchased the materials necessary. » Within six months after closing, they must provide the Land Bank with a Certificate of Occupancy for the house and demonstrate that the house has an occupant. » If the buyer fails to meet these deadlines, they forfeit both the purchase price and the property and are forbidden to bid in all future auctions. Obviously these requirements are strict and some would deem too stringent to be worth the time and effort. These requirements, however, are very important and would be vital to the success of a potentially similar program here in Danville. First of all, they prevent “slum lords” from coming in and buying up large amounts of cheap property and then sitting on them for several years. We are dealing with some of these issues already. Second, the potential buyers would know exactly what they are getting into and what is required of them before they make a purchase. Admittedly, I was, at first, skeptical of how successful a program like this could be but after doing a lot of research, I’ve found the results in Detroit and other cities has been very encouraging. Many houses are being sold far above the median values of their surrounding properties. Most of them have been rehabbed and inhabited within the six-month window. In Danville’s case, we may only be dealing with a couple dozen homes that would fall into this auction system, but at a time when budgets are becoming increasingly tight and the costs for demolitions continue to rise, we need to utilize every tool available to us in our efforts against blight. This partnership with the private sector can provide that and save the taxpayers valuable dollars at the same time. What’s most interesting about this proposal is how it came to my attention. It was a citizen who sent me the link to a newspaper article discussing the success of the Detroit Land Bank program. It only reaffirmed what I came to believe several years ago: many of the solutions to the problems Danville faces will be found outside of city hall. That’s not to say that good ideas don’t come from our city leaders, because they do. But I’ve often found that creativity and innovation are best discovered in the minds of the people who call Danville their home. As we find a way forward on blight, this new land auction proposal is a great example of how such a task force would be beneficial. I strongly believe that the more we can get our citizens informed, engaged and involved in the issues we face, the better off Danville will be. Our greatest asset is our people and it will be the people of our city that propel Danville forward into a new era of prosperity. I’ve often said that I still believe Danville’s best days lie ahead and when we’re working together to achieve our goals, those best days become closer to reality. Because when we stand together, there’s nothing we can’t achieve. Vogler is a member of Danville City Council. VEMMA: HIGH ENERGY LEGIT OR PONZI? CINCINNATI — A controversial company targeting college students is growing on campuses here, especially at the University of Cincinnati, that some complain is causing kids to drop out of college and get themselves in big financial trouble. The Federal Trade Commission has received more than 160 complaints nationally against the Arizona-based company Vemma, including a dozen here. The Enquirer obtained the complaints after filing a Freedom of Information request. Consumers are claiming that the company preys on young adults disillusioned with the current economy, enticed by get-rich promises. One Mason parent reported to the FTC that his son dropped out of college and seemed “brainwashed,” no longer able to think for himself as he chased his get-rich-quick dreams and denounced family members who questioned the company. And a UC student left the Vemma sales force after he watched classmates he’d recruited leave school in financial straits. Vemma sells several drinks, including Verve, which the company hypes as a healthier alternative to energy drinks such as Red Bull and Monster. It is the latest in generations of companies that sell products by recruiting people to recruit more people and make money through recruitment bonuses and a take on the next person’s sales. That’s not a new business model – think Amway, for those of you over 50. The company touts that salaries in the $50,000-a-year range are possible, when Vemma’s own income disclosures indicate that more than 97 percent of its active affiliates earn $12,000 a year or less – far below a minimum-wage full-time salary. Nearly 80 percent earn less than $1,600 a year. Company officials and distributors – most of them college students – interviewed by The Enquirer dismissed the critics as “haters” who don’t understand the business model and are afraid of the unfamiliar. But business experts and consumer advocacy groups say that Vemma warrants a federal investigation as demand grows for stronger regulation of the controversial multilevel marketing industry. Vemma’s web videos – a key component of its recruiting strategy – are slick, with throbbing music, fast edits and sleek cars. One opens with two attractive women driving a convertible while sipping cans of Verve as their long hair whips in the wind. Another includes shots from inside a pulsing night club, images of Verve’s bright, orange can interspersed throughout. Most of the videos feature B.K. Boreyko of Scottsdale, Ariz., the company’s founder and CEO, describing how, in less than a decade, his company has skyrocketed to $100 million in sales, struggling economy be damned. Boreyko’s pitches are enthusiastic and practiced. For more than 20 years, he’s been a leader in what’s known as multilevel marketing. It’s a controversial industry, one that draws comparisons to pyramid schemes because both rely on members recruiting other people to make money for those above them. Multilevel marketing is legal when participants are paid more for sales unrelated to recruiting, unlike pyramid schemes, which are illegal. Before founding Vemma in 2004, Boreyko headed New Vision, which had its own run-ins with the FTC. The agency investigated Boreyko in 1999 after New Vision claimed its product “God’s Recipe” was an effective treatment for attention deficit hyperactivity disorder. Boreyko agreed in a settlement to quit making unsubstantiated health claims about his products. Recently, a consumer advocacy group charged that Vemma sales reps were violating that order by claiming that the products prevent disease. In promoting Vemma, Boreyko doesn’t call it multilevel marketing, preferring “network marketing” instead. Since this spring, Boreyko has made a few tweaks and started referring to Vemma as “affiliate marketing,” likening it to Amazon.com. Marketing experts say the changes are window dressing, and that Vemma – like Amway and Mary Kay and Herbalife – is another multilevel marketing company that relies in part on its distributors recruiting other distributors. On its own, whether that’s a problem is debatable: The business model is controversial but legal, so long as most of a distributor’s money is made from product sales to consumersas opposed to sales to himself or other distributors. Vemma operates in more than 50 other countries, and not without similar controversy: It was investigated in Italy and declared a pyramid scheme there by the Competition and Markets Authority, which leveled the equivalent of a $140,000 fine against the company. Vemma’s emphasis on recruiting young adults is unique in the multilevel marketing world, experts say. It markets what it calls the Young People Revolution (Twitter hashtag #YPR), a Vemma-created slogan that represents sales force members younger than 30. Why recruit so young? Brad Wayment, Vemma’s chief operating officer, told The Enquirer that the company never set out to target such a young demographic, but that the product was a hit with college kids, and the company simply wanted to be supportive. In sifting through hours of Vemma videos posted at various outlets online, The Enquirer found footage of Boreyko providing another reason: so that young adults can hit up their parents and grandparents to buy the products. Bonnie Patten, executive director of the Connecticut-based consumer advocacy group Truth in Advertising, said the emphasis on young adults is concerning. Most haven’t had much real-world experience and are too trusting, she said. Among the targets was UC business major Daniel Cao. Last summer, he was invited to a pool party that was actually a recruiting event hosted by a few Mason students. Cao was intrigued. He liked the way Verve tasted and figured he’d be buying Red Bull or another energy drink anyway, so he might as well try to sell Verve and make some money. When the six months were up, he’d barely broken even on product sales. He kept his promise to his parents and bailed, and has since become a vocal critic of Vemma’s practices. “I’d been told Dr. Oz and Oprah were sponsors, which wasn’t true,” Cao said. Worse, he said, he recruited others who ended up in worse financial shape than he. Two dropped out of UC, he said, and one was kicked out of his family’s home. It’s a familiar refrain to William Keep, a pyramid scheme expert and dean of the School of Business at The College of New Jersey. A former University of Kentucky professor, he has been a trial expert in several government cases against companies suspected to be pyramid schemes. It sounds reasonable, he added, but it often isn’t true. Douglas Brooks, a Boston franchise lawyer who has brought several class-action suits against multilevel marketing companies over the past 20 years, agreed. Brooks is pushing for tighter industry regulations in the wake of the FTC investigating another multilevel marketing company called Herbalife. He couldn’t say whether Vemma might be a pyramid scheme because current regulations require a complete disclosure of each company’s finances to make that determination. “They don’t have to disclose everything you need to know in order to make that judgment,” Brooks said. The FTC has the power to determine if the company is a pyramid scheme, but spokesman Peter Kaplan said FTC investigations – or even the existence of investigations – aren’t public. The FTC has acknowledged that it’s investigating Herbalife because the company disclosed it first. The attorneys-general offices in Ohio and Kentucky said they haven’t fielded complaints about the company, but Better Business Bureau offices nationwide have received dozens. That college-friendly emphasis isn’t as evident in Boreyko’s online videos. “Last week, I read this article in Forbes magazine and they were calling the college education system in this country a pyramid scheme,” said Boreyko – himself a high school graduate – in one video blog posted on YouTube. That’s the type of sales pitch that worries consumer protection advocates. Multilevel marketing companies have developed and honed their messages for decades “to push people’s buttons and get them to suspend critical thinking,” said Brooks, who last October filed a petition with the FTC on behalf of an international consumer advocates coalition asking the agency to investigate the industry. Having those messages unleashed on impressionable kids is dangerous, Brooks said. “They’re subject to all sorts of influences, they’re financially challenged because of the tremendous cost of a college education, and the recruitment techniques that are used by MLMs in general are very deceptive techniques,” he said. Are phone companies ‘cramming’ charges onto your bill? If you haven’t looked at your cellphone bill recently, you may want to start reviewing it for suspicious charges. The practice of placing misleading or unauthorized charges on a consumer’s cellphone bill — also known as cramming — has bilked billions of dollars from customers over the years, according to reports by the Senate Commerce Committee. Last year, the committee introduced legislation that would prevent companies from billing unauthorized third-party charges to consumers’ landline phone bills. In response, wireless telephone carriers vowed to stop “premium text messages,” which represent a majority of third-party charges, according to Law360, a legal-news service. But consumers can still be vulnerable. Last week, the Federal Trade Commission filed a suit against T-Mobile USA Inc., one of the country’s largest wireless carriers, alleging the company collected millions of dollars from customers in the form of unauthorized charges for premium text subscriptions. STORY: T-MobIle CEO: FTC ‘sensationalizing’ bill claims The FTC alleges that the company received up to 40 percent of the total amount charged to consumers for third-party text services such as horoscopes, flirting tips and celebrity gossip that cost $9.99 a month. John Legere, T-Mobile’s president and chief executive officer, wrote in a blog last week that the FTC is “sensationalizing” the issue. “It is true, that back in 2009 thru 2013, all of the big carriers in the wireless industry, including T-Mobile, began carrying what became known as the Premium SMS services. We were all billing for these services on behalf of the content providers who were responsible for obtaining the customers’ authorizations,” Legere wrote. “As we all know now, there were some fraudsters in that bunch. That is why, as we found them, we terminated them and, ultimately, made the decision in November 2013, as did all four of the wireless companies, to eliminate this from our service offerings,” he wrote. Jeff Blyskal, senior editor for Consumer Reports, said phone numbers, like credit-card numbers, can be misused by scammers. He said wireless companies haven’t been required to block out these unauthorized charges because the Federal Communications Commission rule on cramming applies to landlines, not cellphone service. t-mobile T-Mobile says the accusations that it added bogus fees are false. (Photo: John MacDougall, AFP/Getty Images) It’s not unusual for third-party merchants to sell goods and services through phone or wireless carriers. But “when a customer doesn’t authorize the service, it’s called cramming,” said Brian Shull, an FTC attorney with the division of financial practices. For example, consumers can be tricked into handing over their cell numbers, often because they believe they are signing up for an innocuous text service, such as a daily horoscope. The solicitation often comes via text, and there is usually a charge associated with the service, which is touted by a third-party company working with the phone company. Cramming has been around since the 1990s, when third-party merchants began adding unauthorized charges to customers’ landline phone bills. The FTC has been pursuing third-party merchants who use deceptive practices for some time, but the action against T-Mobile marks the first time the commission has filed such a suit against a wireless carrier. In 2012, Scottsdale technology entrepreneur Jason Hope and his company, Jawa, reached settlements in two separate lawsuits related to allegations of deceptive billing practices by the mobile-phone application developer and its affiliates. Verizon Wireless had accused Jawa of a scheme that used premium text-messaging campaigns to defraud both Verizon and its mobile-phone customers. The Texas Attorney General’s Office accused the Scottsdale company of “improperly adding expensive, unauthorized charges to Texans’ cellphone bills.” In 2004, the Arizona Corporation Commission approved rules against cramming, requiring telecommunications companies to remove charges from bills promptly and give a refund within 45 days from the date the bill is changed. A settlement has not been reached in the T-Mobile case, and it remains in litigation, according to the FTC. Tips for avoiding ‘cramming’ charges According to reports by the Senate Commerce Committee, cellphone consumers have been charged millions in unauthorized fees. The Homeowner Flood Insurance Affordability Act was signed into law by the President March 21. It amends some provisions of the Biggert-Waters Flood Insurance Reform Act of 2012. Find details here as they are made available. Flood risk changes from year-to-year. Enter your zip code to see if there have been any recent map changes in your area. Legal Employment law is a volatile area because political and economic tensions seem to most quickly influence employment-related regulatory activities at federal and state levels. As we approach the halfway point of 2014, there are five noteworthy topics/trends in employment law that you should be aware of in order to proactively address potential high risk areas for your business and stay compliant with the law. There is a growing trend of audits by regulatory agencies (and the IRS) of employers’ classification of workers as “independent contractors.” All employers must remember that the legal test utilized by most federal and state regulatory agencies to search out and identify worker misclassifications is usually more stringent than both the IRS’ and common law tests. Most employment agencies presume as a default that every worker is an employee, and the burden always remains on the employer to prove otherwise. Whether a particular worker may be free from “direction and control” is just one factor to consider. To survive scrutiny, an employer also must establish that (1) the services the worker performs are either outside the employer’s usual course of business or outside the employer’s place of business, and (2) that the worker is engaged in an independently established trade, occupation, profession or business. In addition, the US Department of Labor (USDOL) and the IRS have now made worker misclassification an area of priority of investigation and control. For example, on November 12, 2013, a bill was introduced in the U.S. Senate entitled the “Payroll Fraud Prevention Act of 2013.” If passed, it will amend the federal Fair Labor Standards Act (FLSA) and impose significant penalties on employers who intentionally misclassify workers as independent contractors. Even if not ultimately passed, it evidences a priority on the federal level. In light of this trend of increased scrutiny and the potential risk of significant penalties, if your company has recently made a “close call” in classifying workers as independent contractors, it would be wise to consult with an attorney to confirm the decision is proper. It appears that many employers continue to assume (incorrectly) that all of their “salaried employees” are not entitled to overtime pay. In fact, paying an employee a salary does not necessarily mean the employee is exempt from the minimum wage and overtime requirements of the FLSA and similar state laws. In addition to determining merely whether the employee is “salaried” and stopping there, employers also must consider the duties the employee performs and whether those duties qualify the employee for an exemption. Because misclassification can result in liability for two years of back pay (three years for willful violations), as well as double damages and attorneys’ fees, this issue has become an easy target like low hanging fruit for the USDOL and, more importantly, to plaintiffs’ attorneys (who see a ripe source of damage with which to justify generating large fees). To assess whether an employee is properly classified as exempt, there is a lot of information online to provide an initial guide. But, we also strongly recommend that your company consult with an attorney before making a final determination on classifications (especially in the case of any reclassification process). If you haven’t already done so, it would be prudent to review and possibly update your criminal background check procedure in your Employee Manuals. Although the Equal Employment Opportunity Commission (EEOC) has been under attack in recent months on this issue, the agency continues to aggressively pursue compliance with its updated Enforcement Guidance on the Consideration of Arrest and Conviction Records in Employment Decisions Under Title VII of the Civil Rights Act of 1964. Therefore, you must be very cautious now in asking job applicants to answer generic questions about their criminal convictions on employment applications, as the new trend is for state and local jurisdictions to deem such inquiries to be illegal. Effective January 1, 2014, gratuities automatically added to customers’ bills by employers in the hospitality industry (for example, an automatic 18 percent gratuity on parties of six or more) will not be considered “tips,” but rather “service charge wages.” This will impact not only employer recordkeeping and reporting obligations, but also compliance with overtime rules under the FLSA, as such mandatory tips need to be included as part of an employee’s regular rate of pay in order to properly calculate the overtime rate. Failure to comply with the rule may subject hospitality employers to increased scrutiny by the IRS, the USDOL and plaintiffs’ attorneys. Accordingly, employers in the hospitality industry should review their recordkeeping and reporting practices and wage calculations regarding these mandatory gratuities. A recent case from a Circuit Court in Fairfax, Virginia, is instructive on how courts are continuing to struggle with balancing the protection of employers in making resource investments to train employees versus allowing such employees to go out and earn a fair living once separated from the company. (See, Wings, LLC v. Capitol Leather, Fairfax County Circuit Court, March 2014). In the case, the employer sued two ex-employees who went to work for a competing residential vinyl, fabric and leather repair business. The vast majority of the plaintiff-employer’s customers were automobile dealerships and collision repair centers that hired the employer to furnish interior features in vehicles. The employer had spent significant time and resources providing extensive technical training and marketing and business development methods to the ex-employees as technicians and then assigned them to territories in which to regularly contact customers. When the two employees quit and went to work for a competitor, the employer filed the lawsuit and attempted to enforce restrictive covenants which sought to prohibit the ex-employees from working “in a position that was the same or substantially the same” as their jobs with the employer, with any business that had within the past 12 months competed with the employer, and it sought to apply the prohibition to any U.S. state or foreign country in which the employer had conducted business within the last 12 months. Evidence demonstrated that, during the previous 12 months, the employer had conducted business in Virginia, Maryland and West Virginia. The court, however, refused to grant a preliminary injunction enforcing the agreement because the geographic restriction was overly broad and not narrowly drawn to protect the employer’s legitimate business interests. As drawn, the agreement would prevent the former employees from working, for example, in Abingdon, Virginia, more than 300 miles away from Fairfax and an area in which the employer did no business and had no legitimate interest in protecting from competition. According to the court, requiring these two residents of Northern Virginia to attempt to locate work outside Virginia, Maryland or West Virginia simply put too much of a burden on them in their efforts to earn a living. As you can see, the trend continues to be for courts to strike down non-competes in Virginia, and it is increasingly difficult to attempt to draft a non-compete agreement carefully enough so as to not appear to be over-reaching. Again, we suggest that you retain a lawyer to assist you in carefully crafting these restrictive covenants as narrowly as possible so that they have a chance to be enforced under Virginia law. The preceding is for general informational purposes only and not intended to constitute specific legal advice or form an attorney/client relationship. Please seek the services of a licensed attorney for specific legal advice.